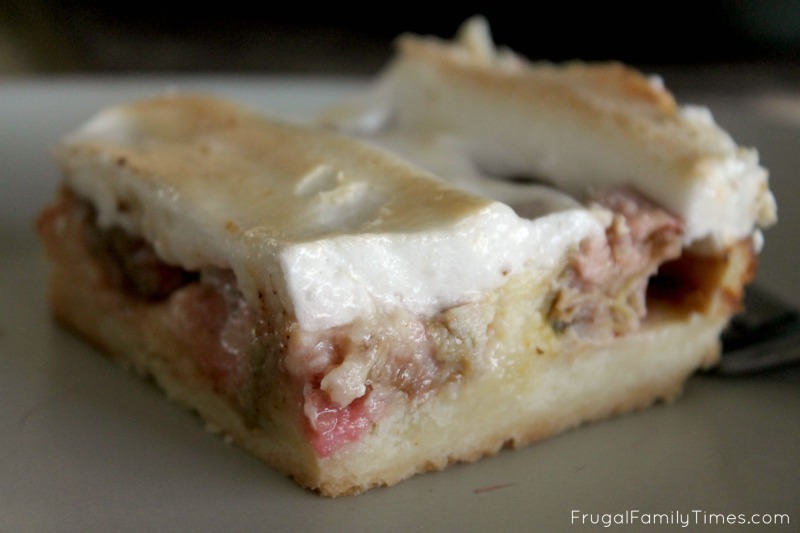 Rhubarb Custard Bars with Meringue Topping - Perfect for Potlucks! I don't know about your workplace, but mine has a culture of potlucks. So. Many. Potlucks. For all the seasons, honouring life events and holidays - and sometimes just for fun. Don't get me wrong, I enjoy sharing a meal with my co-workers - and potlucks are a great way of doing this when a non-profit like ours has no budget for catering. We can have a bit of a celebration without costing the organization to feed a big group. But, potlucks take more planning and preparation than our usual no-brainer method of taking lunches to work. And normally I'm pretty on top of planning meals - but I've got a blind-spot for planning for these potlucks. It's pretty darn common for me to realize late the evening before that I need to have something extra delicious to take to work tomorrow. Reheated leftovers are not going to cut it for my colleagues. Our teenage daughter Charlotte's latest baking creation is terrific for potlucks. I often get asked for this recipe when I take it places - so you know it's tasty! It's the perfect mix of tangy and sweet. Squares, like this and Charlotte's Blueberry Pie Squares, are handy for potlucks and gatherings. You can cut them to whatever size it going to meet your groups' needs. 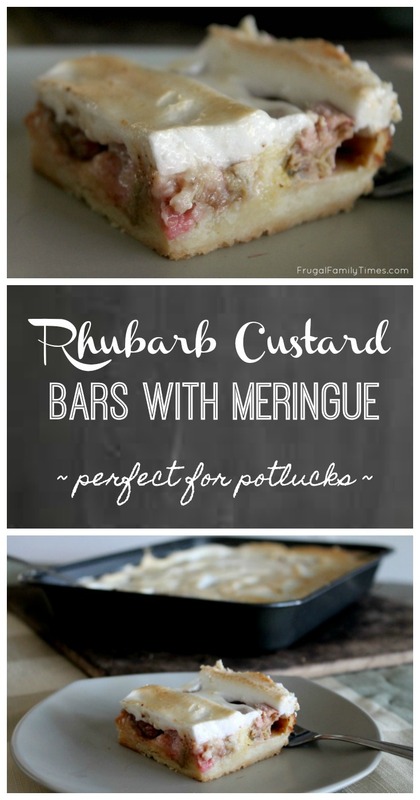 Beyond being delicious these Rhubarb Custard Bars are great for forgetful bakers like me. All the ingredients are easy to find in a pretty basically stocked kitchen - no extra trips to the grocery store! Plus it uses frozen rhubarb - which I always have a giant bag of in my freezer. Perfect for potlucks! 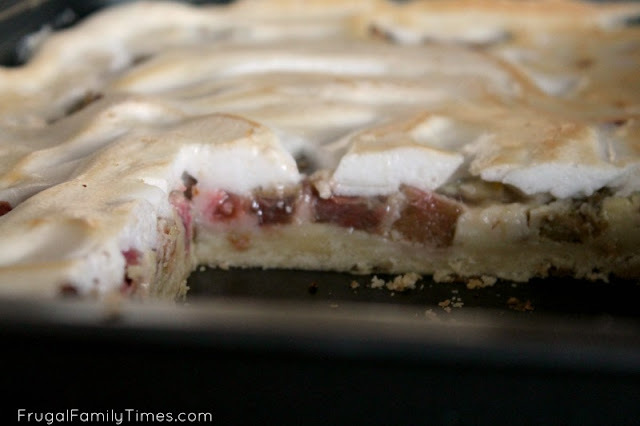 Uses fresh or frozen rhubarb. Mix 1 1/2 cups flour and sugar in a bowl. Cut in butter until it's crumbly. Press the mixture into a 9" x 13" pan. Bake for 10 minutes. Cool crust on a baking rack. Lower oven temp to 325. While it bakes, make a meringue of the egg whites - beat until it forms stiff peaks. 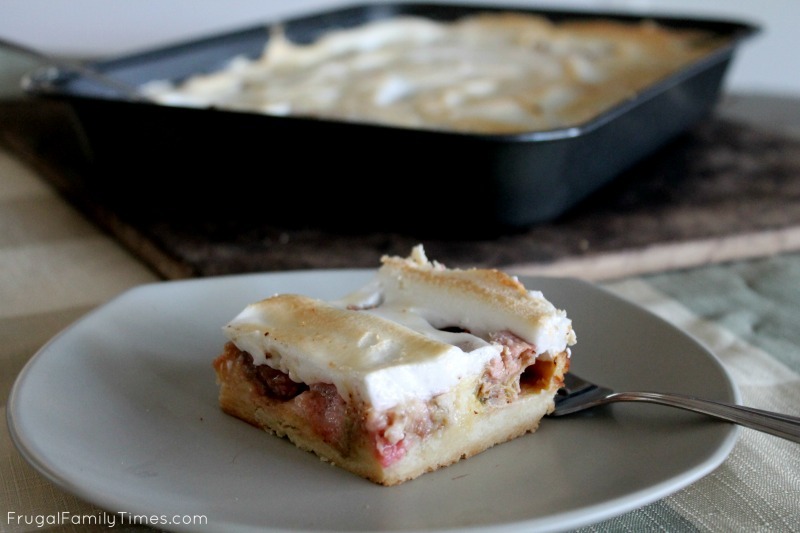 Remove cake from oven and immediately top with meringue. Broil lightly in the oven - for 30 to 45 seconds. Don't miss Charlotte' other wonderful - and usually kid friendly - baking creations! Just found some rhubarb in my freezer while clearing it out. New recipe to try.